My University of Birmingham colleague David Dunn and I have spent Thursday talking to radio outlets about the turn of former White House chief strategist, against Donald Trump including comments that could further implicate Trump advisors in the Russia investigation, denigration of Ivanka Trump as “dumb as a brick”, and questions about Trump’s own fitness to be President. This is partly political differences and partly personal differences. 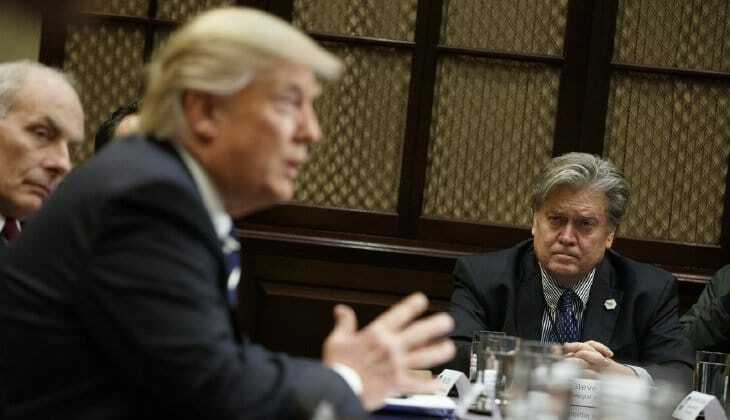 For Bannon and [his hard-right outlet] Breitbart, the Administration has failed to follow through on a lot of things that it promised to do with the right-wing agenda, on ObamaCare, on even more sweeping tax cuts, on immigration, on foreign policy, and they see themselves as betrayed. Bannon was Trump’s brain. Bannon was Trump’s architect. And now being estranged from that role, he sees a role for himself as a way influencing the electorate by attacking Trump as someone who hasn’t followed through and perhaps creating a platform for himself and other candidates. We’re talking about gossip meets a Constitutional crisis. If you’re a Republican voter, where do you go now? Do you go back to the Republican establishment? Do you stick with Trump? Do you join the Bannon insurgency? There’s a bonus discussion on why Donald Trump will not be President this time next year.